Vertical CCM features a flexible and simple network design based on a pure IP-based modular architecture. Easy installation with LLDP, auto registration and management via web-based remote/central management, Cloud Call Manager can be used with a mix of digital (T1 / PRI / SS7), analog (E&M, RD, LD, CO) and SIP trunks. Reduce communications and operational costs leveraging internal VoIP calls and centralized SIP call management. Cloud Call Manager offers a wide range of store-side gateway options including SIP/TDM gateway functions, fail-over/survivability and voice quality management capabilities (available early 2016), along with support for high-end video, IP/SIP, Wi-Fi, softphone and mobile clients, as well as existing digital and analog phones. Cloud Call Manager supports nearly 1 million ports and 1 million BHCC, with almost unlimited scalability by networking multiple servers. Ensure local survivability with a range of options for local call servers or gateways, and maximize service availability with multiple redundancy options, including call server, LAN and power. Cloud Call Manager provides you with full analytics and BI support features, and interfaces with Vertical’s Retail Applications Suite and other third-party business communications applications and solutions to streamline and enrich customer interactions, and improve customer service. 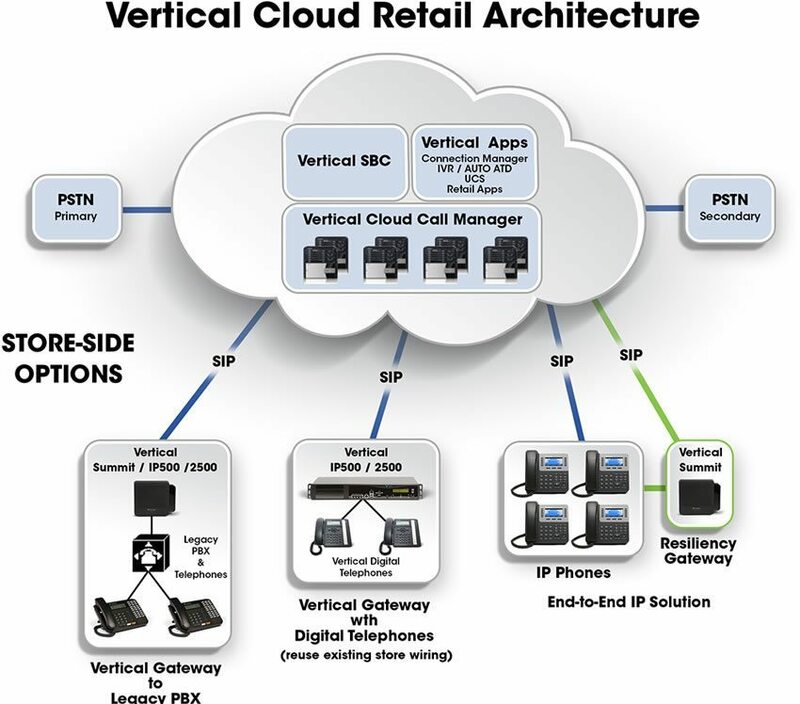 Full “end-to-end” IP solution with Vertical Edge IP phones, failover and VQM.